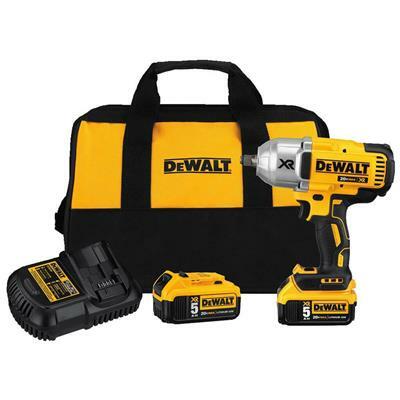 The DEWALT DCF899HP2 20v MAX XR Brushless High Torque 1/2" Impact Wrench Kit with Hog Ring Anvil, 5.0Ah features a brushless motor which is designed to provide superior run-time, performance and durability. 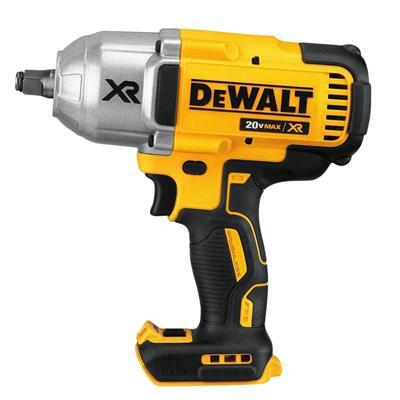 It has a heavy-duty impact mechanism with a max torque at 700 ft./lbs. for best-in-class torque with the most demanding applications, with a max breakaway torque at 1,00 ft./lbs. This tool features a 3-speed selector switch that allows for application specific torque/drive control. It also has a LED work light with a 20 second delay that will provide visibility when working in dimly lit spaces. Even though this tool is ergonomic and lightweight, it can handle a 6-8ft drop and is resistant to chemicals, grease & cleaners. A battery fuel gauge indicator will inform you about the level of charge available in the battery pack. The hog ring offers quicker/easier socket changes for users who swap sizes frequently and don't require maximum retention. Item Length: 17.1 in. Item Width: 9.8 in.